I’ve always had a thing for tigers. I’m fascinated by the sheer majesty of the huge felines. Their beauty is riveting; powerful, rippling muscles, all wrapped up in sleek orange and sophisticated black stripes. One day last year I decided to add a tiger to an ongoing canvas, not knowing that in doing so, I was entering into a tiger “phase”. I sketched my tiger, poised with his front paws up on a stone for a commanding view, and then had to stop for life’s little details (like supper, and dishes) before I could get to the fun part of painting him. A few days later I received an email from a total stranger, written entirely in German. I have a German heritage, and married into a very German family, but can, unfortunately, read only a few words of the language. Thank goodness for Google translate! My email was from a young woman named Sarah, who had admired my artwork online and wondered if I was open for a custom project. She was in the midst of completing her first children’s book and wanted me to design the cover. Sarah had to give me a quick rundown of her story, since, as I said earlier, I don’t do well with German. Yes, I was interested in her project! 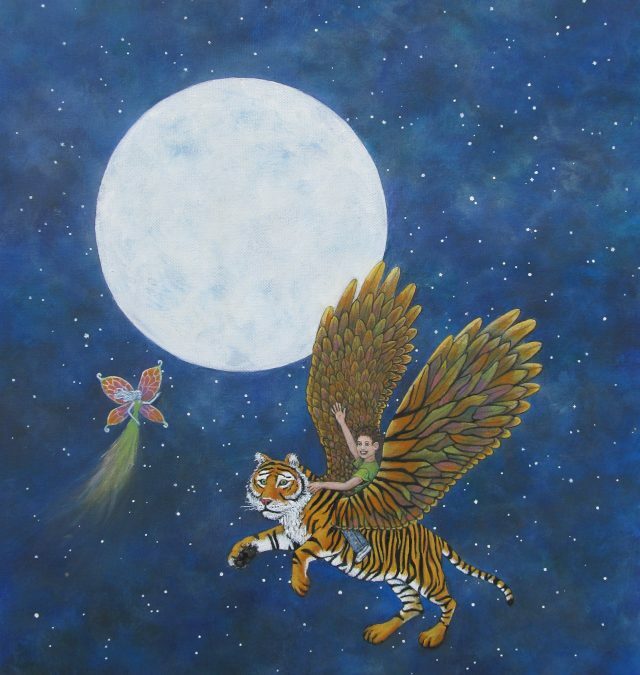 Especially when I discovered that her story involved a magical flying tiger. Through a series of emails, Sarah and I designed a wonderful fantasy scene and I thoroughly enjoyed every minute of it. (Sarah’s English is much better than my German, but we still kept Google translate busy.) This was a great project! What is not to love about helping to create a marvelous adventure for young readers? Plus, how often do you get to totally invent splendid wings for a mythical tiger?